​Betsy is a College of New Rochelle graduate who received her Bachelor of Science in 1990; she majored in Art Education while earning her teaching certification. She has a M.A. in Education with a concentration in Gifted and Talented Education. She earns a living as an elementary school art teacher. In addition, for the past eleven years, she has been an adjunct professor for art education courses at Manhattanville College in Purchase New York. 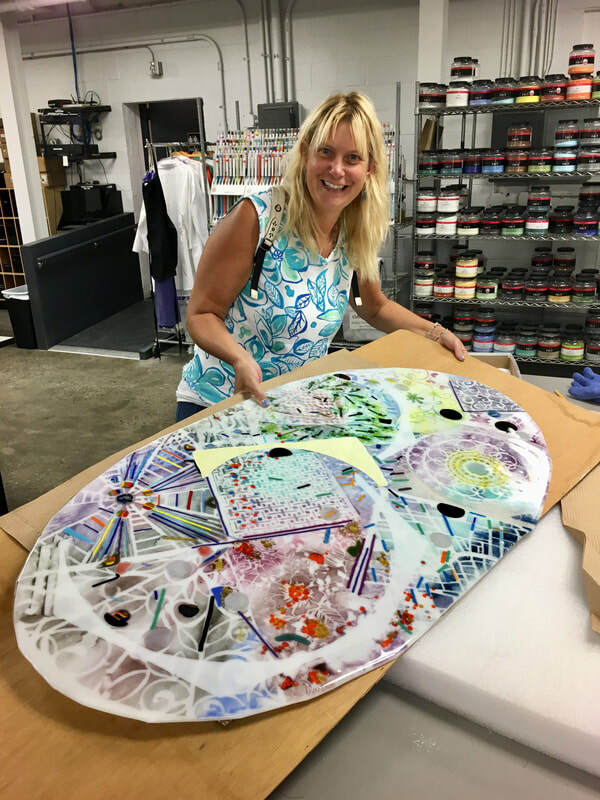 The Bullseye Glass Resource Center in Mamaroneck, New York has served as a springboard for the founder of Gypsy Lane Glass Studio's continuous energy to create fused glass objects. Betsy Murphy has come to the understanding that fused glass uses the heat of the kiln to fuse (or join) pieces of glass together at high temperatures. Different colored glass, different forms of glass and varying kiln schedules provide a wide variety of effects for jewelry, wall art and functional art glass. Simply said, Betsy works with glass by layering different pieces on each other and then firing them in a kiln. When she is creating, she does not start with a conceived pattern or design. She pieces together each project, which leads to the finished artistic creation.